Maud Elizabeth Nendick, daughter of William Harrison Nendick and Lucy Elizabeth Custer, was born Dec. 26, 1886 near Conway, Taylor Co., Iowa and died April 11, 1984 at Moberly, Randolph Co., Missouri. 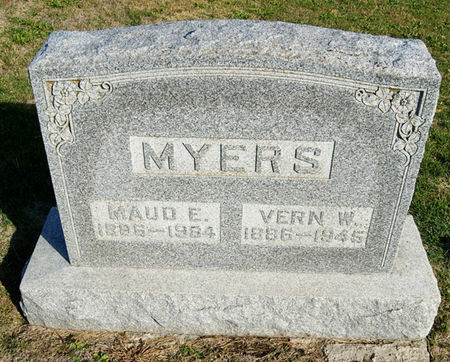 She married Vern Welcome Myers Dec. 8, 1908 in Taylor Co., Iowa Iowa Marriages gives the date as 1909. He was born Feb. 7, 1886 near Glenalpine, Antelope Co., Nebraska, son of Louis Jackson Myers and Josephine Sisk, and died Oct. 27, 1945 in Santa Rosa,Guadalupe Co., New Mexico. Searching for VERN WELCOME MYERS in Taylor County Iowa?